My buddy Zack Williams did a casting demo at the Sandy Spey Clave with that title. I wanted desperately to see his presentation but they moved it up an hour and I showed up just as he had finished. You see, Zack knows a few things about casting and fishing clean. He has been at the Big Show in San Francisco the last few years, battling it out with the best casters in the world. I truly believe he is one to watch in the next few years as he further hones his long distance casting skills. I am excited to watch the progression of a friend as he takes the competition game on full force. You can't compete on the world stage without proper turn over of the line and leader. In competition this can be the difference between a top 5 finish and being at the bottom of the list. In a fishing situation it can make a huge difference in the number of fish that are able to see and then grab the fly. Zack has taken what he has learned about distance casting and transferred that knowledge to his steelhead fishing. Zack catches fish and he often catches fish a long way from where he stands. He does this primarily by casting precisely, consistently and getting full turn over of the entire fly line, leader, and fly almost every time. Is he perfect? No, of course not but his turn over percentages are high and this translates into more hook ups. Yes its that simple people. When you see hookups at distances of 150 feet or more you will become a believer in complete turn over. Why cast it to those distances if it ain't gonna fish for the first 40 feet because the line is not straight? I have thought about this topic many times and Zack got me thinking about it again. So now ask yourself these questions. Do I get consistent turn over of the fly line, leader and fly every time? Do I make large mends to straighten line that did not turn over all the way? How do those mends affect the subsequent swing of the fly? Am I missing crucial points in the swing arc because I don't get get full turn over? Am I casting at an angle that allows my fly to swing instantly when it does turn over? Face it people, steelhead fishing is a numbers game. When I say numbers, I mean numbers of casts and not numbers of fish. Most of us have limited numbers of days or times that we can fish. Learning to consistently turn the whole line over all the way to the fly is crucial to showing the fly to as many steelhead as you possibly can. It's simple math people. When you make hundreds or thousands of casts in a week of fishing, make good ones. The more consistently you get your fly to fish the better off you are. 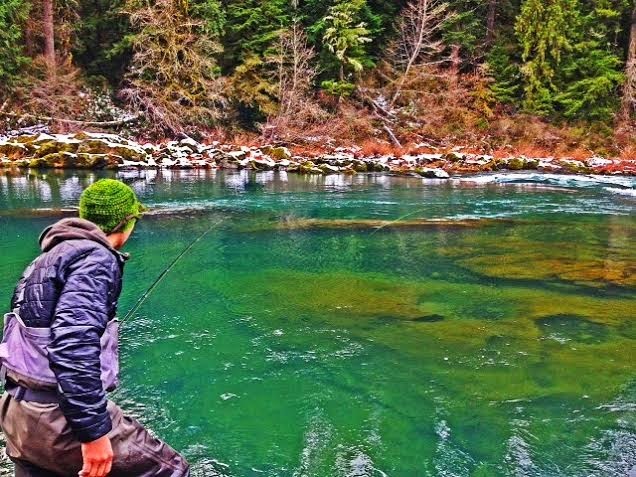 Rivers that allow for a step and swing approach like the Deschutes, Grand Ronde, Clearwater etc. are rivers that can require long casts. With all the new rods and lines out there, casting far has become easier to some degree. But if you can't turn all your junk over at long distances you may be selling yourself short. You are leaving a lot of potential grabs on the table if only 50-60 percent of your casts are turning over all the way to the fly. Fish hold waaaaaaaay out there on many of these rivers but if you have inconsistent turnover you are not gonna get those grabs. Practice consistent turn over at the distance that is within your limits. If that's 60-90 feet so be it. You can rest assured that you are covering water well when you have good turn over. You can leave the run knowing that it was worked well. Distance and consistency comes with days on the water. Fish within your limits. I see a lot of people that can "cast" far but have inconsistent turn over. Generally speaking, a fish is triggered to eat by the consistent speed and placement of the fly as it covers the swing arc. A fish is sitting, watching, waiting, and can usually see the fly long before it gets in front of him. He is tracking speed and swing and is waiting for the fly to get into his grab zone. A fly that does not turn over in the critical grab zone will not swing right. You are blowing it! A fish that was keyed to pounce is now put off by a fly that does not do what he expected it to do.The angler will either mend to straighten out the line or let the fly go without a mend, Both of these cause a problem with the consistent speed at which the fish was watching the fly. The big mend to straighten out the line moves the fly too much and it may be pulled out of the grab zone at the wrong time. Letting the cast go when the fly and line lands in a pile will then accelerate the fly unnaturally causing the fly to move too fast through the grab zone. Another thing I see, especially on smaller rivers is proper turn over at short distance. No one talks about this factor. On the river I fish, I catch fish every year in several spots with barely the leader out. Be mindful of those close fish. They are there and will eat if you give them a chance. Pulling a bunch of line off the reel to start the run misses uncountable fish. Become familiar with casting that leader and small amount of fly line. Its clunky and weird on a short line but can produce fish incredibly close in if done cleanly. Are there exceptions to all of this stuff? Sure, we have all caught fish on bad casts that were perceived to be either too fast,too slow or where we are sure we have pulled the fly out of the zone with a big mend. Also,there are a number of scenarios where we can purposefully put extra pace on the fly in certain situations to elicit a strike. Conversely there are also times when we will slow the fly down radically with rod and line manipulation. These are particular actions in particular situations, for particular fish. Another time I break a lot of rules as far as getting tension to the fly quickly is with skaters on the surface but that's another story for another day. We can't over think this stuff too much because we all know that steelhead can make a liar out of us on any number of occasions if we become to rigid in our thinking. The point is, whatever distance you are fishing, fish it as cleanly and consistently as possible! What made them great? Was it who you were with? Was it the way the fish took the fly? Did it come after a long dry spell? Was it on a especially memorable trip or day on the river? Was it in a favorite pool? Was it in a place you didn't expect? 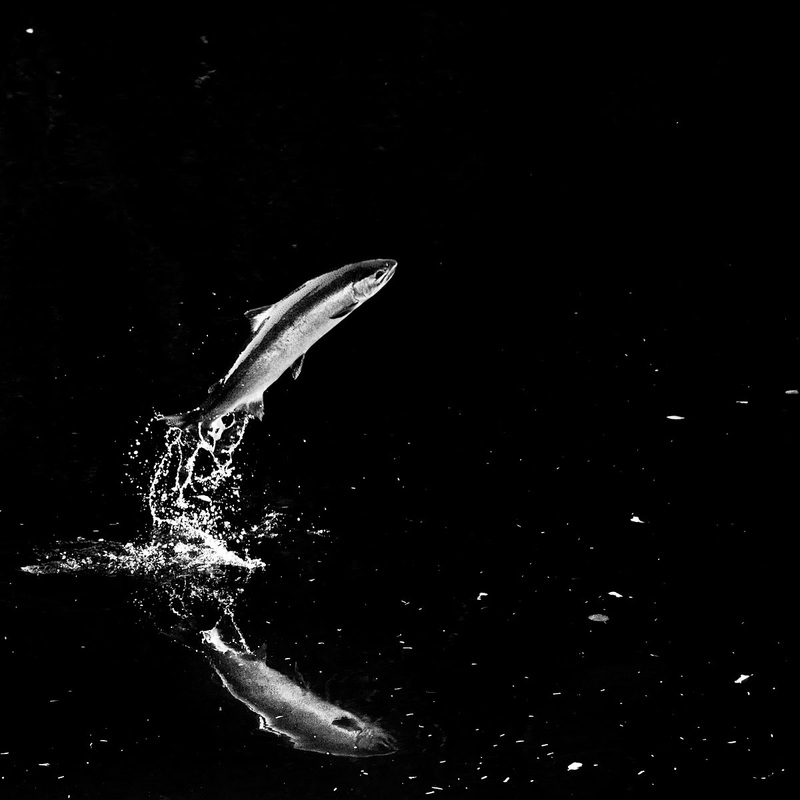 There are many ways a steelhead can eat a fly. I have not seen them all yet I know. They are all good however they come we can all agree, but some are just better than others. Let's examine a few different types of steelhead grabs and see what exactly makes a good grab and why we love them so much. Short Line Surprise- The grab comes with no warning with 20-30 feet of line out. The fish is on and taking line before you even start to get in the groove of the swing. This one is always a welcome grab due to the early payoff. Mid Length Meltdown-This is that fish in the heart of the run, sitting in the prime rent district. The fish is well rested and feisty and this grab comes where you expect it to but you are never really ready. Solid grab followed by line burning run. This one is good because you are ready for it. Long Distance Devastation-You have a ton of line out and the grab comes on a spongy stretched line. You are instantly in your backing and things can get ugly quick if you can't chase him down.We all like these because its always fun to hook and land one from way out there. Dead Drifted Drilling-A great and rare grab that comes when you toss a dry fly offering upstream and let it drift down a seam or riffle line. The take can be violent or very trouty depending on water speed and structure. These types of takes are great because they are usually very visible. The fish is generally across from you and fairly close and you can often see the entire rise and take. Tail-out Tug-O War- A grab that comes at the end of the tail-out. You are always surprised at how far down they will hold. Now its time to try and keep them in the pool. I love these because you are always testing your skill and tackle and knots if they leave the pool. A challenge to land them when they do. Skater Slam-A fly mauling that can occur almost anywhere and often comes without warning. Head and tail out of the water, vicious full body commitment. Very visual, very violent and most often the fight is much the same. A fist fight in a phone booth. Wet Fly Whack- One of my favorites, wet fly just under the surface, fish hits hard on a tight line, pandemonium ensues. These are great because there is often a visible rise to the fly as the fly is just under the surface. A moving aggressive fish that chases the fly on top or just sub surface is the fish we are looking for. Deep Swing Swat- Another personal favorite, the slow tightening of line on a deep,slow winter swing followed by a series of monstrous head shakes leading to a hot winter buck that leaves the park. These grabs are often very aggressive once it goes tight due to the weight and water tension of line,sink tip and fly so deeply sunk. These are those hang on to the rod grabs! "Watch This" Whammo- When you know its gonna happen. You have a player up and you know he's gonna eat. It is a seldom occurrence but can happen and it's cool when you can turn to a buddy and say "watch this" and the fish eats! The more you fish the better you become at reading the fish and knowing when to make this call. First Cast Ferrari- You take the fly off the hook keeper, pull out enough line to make a cast on a short line and get a hard grab as soon as the fly hits the water and swings two feet. Always takes you by surprise and these fish don't usually disappoint. They are in close and have room to run. The hook sinks quick on a short line with very little stretch and the fish is often just as surprised as you. Last Cast Crush- This usually comes when you are in a sweet run and you know you are in the zone but timing or fading daylight has you leaving before you can finish the run properly. You know that "Just let me make one more cast" and it happens! These are always cool and serve to show that sometimes you can just feel it before it happens. Far Off Farming- That far off take that you never can get tight to due to the elasticity and slack that occurs in the line and leader when fishing at long distances. The grab can be feel subdued or very soft at those distances .Sometimes they stick but we all know that "start up the John Deere" feeling when they come off in a tail walking aerial display 100 feet away. Tight Line Tornado- Similar to the Wet Fly Whack this one is also on a dry line with either a waking fly or wet fly, a great yank followed by a fish that spends more time in the air than in the water. These are the hard ones to get a hook into as they never let the line get tight with water tension. This is a great grab because the fight is so visual. You can see you quarry and you are working hard to get him to stick. A lot of rod angle things going on trying to get tight to this fish. Line Wrap Train Wreck- You know this one, Cast after cast you are in the zone, you are not paying particular attention to that loop of line that has wrapped around your reel handle or bottom handle of the rod after the last cast. The fly swings undaunted, the take is heavy as your reel has no line to give, sometimes you can keep them on by freeing your line but most of these end in a quick separation of you and the target species. The Sip and Zip- A barely noticeable surface disturbance,sometimes just the mouth or lips of the fish break the surface to take the fly down. This is a very casual take until the fish feels the sting of metal and bolts from his lie. The casual sippers become active rippers in a heartbeat. Its getting close to time for some summer fishing, I am looking forward to a great season ahead.